The variety of products in industrial series production is immense. However, no matter which market you are servicing, you will always have the right machine concept in the Powermat 2400. The Powermat 2400 offers you both a high-performance platform for the demanding requirements of everyday multiple shift operation as well as great flexibility. This is assured by a modular system with a wide range of aggregates, tools and feed speed solutions. The modular design and large number of options enables the most diverse applications. 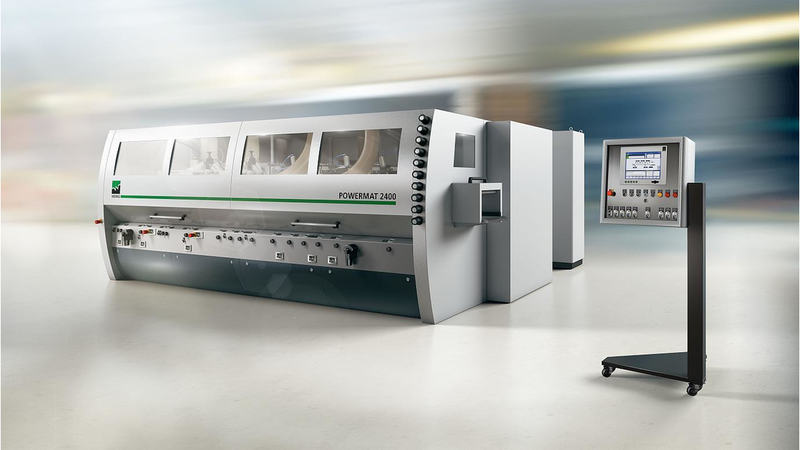 Whether planing beams at 10 m/min or producing mouldings at 100 m/min; whether 4,000 rpm or up to 12,000 rpm – we can build the ideal Powermat 2400 for your requirements. With spindle speeds up to 12,000 rpm, jointing technology and strong feed systems, the system provides optimal conditions for series production in the legendary WEINIG surface quality. The Powermat 2400 is truly state-of-the-art technology in profiling. The Powermat 2400 already fulfills high demands as a stand-alone machine. However, the full potential could be far greater. By upgrading the machine with the PowerMech automation system, you can increase efficiency significantly further. The PowerMech modules are the key to maximum profitability and optimal productivity. The functional units range from an infeed or outfeed system through scanning and conveying to packing and stacking. With the high level of automation you can decide how far you want to exploit the amazing capabilities of your Powermat 2400.